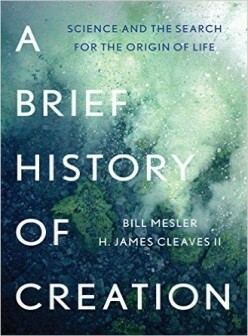 Bill Mesler will be discussing his new book, A Brief History of Creation. Described as a “rich, masterfully woven tale of our still-evolving ideas about life and how it came to be” by author and scientist Sean Carroll, A Brief History of Creation is the epic tale of the often quixotic search to understand perhaps the most important question science has ever faced. It is a story that encompasses many of the seminal moments in the history of science, and is filled with some of its most colorful and iconoclastic thinkers – Darwin, Pasteur, Crick and Woese, to name just a few. Mesler will examine how the scientific search has been shaped by religion, philosophy and even politics. He will discuss how the march of scientific progress is not nearly as straightforward as we often assume. Bill Mesler is a veteran journalist who has worked for the daily Santa Cruz Sentinel, the weekly San Francisco Bay Guardian and The Nation magazine. Due to unforeseen circumstances, we will be unable to use the National Science Foundation for this Saturday’s NCAS talk. Instead, the talk will be held in the atrium behind The Front Page, which is in the same building as NSF (4201 Wilson Blvd., Arlington, VA).